Ideal ground floor apartment for summer holidays. 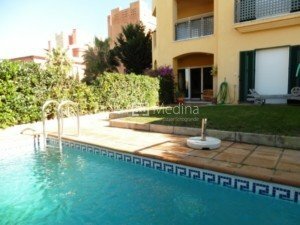 This charming apartment in Ribera del Pez Luna, has a great location, being close to the leisure areas of Sotogrande. It has beautiful views on the marina. The accommodation consists of a living / dining room with access to a covered terrace and garden with views to the Marina.2 bedrooms with bathroom, fully equipped kitchen, marble floors throughout the property and fitted wardrobes in the bedrooms. Features; centralized air conditioning hot / cold. 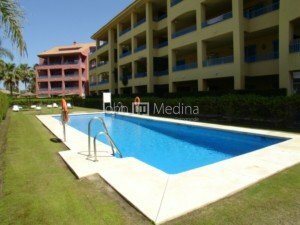 a private parking space.There is a communal area with swimming pool in the complex. Available only in short term rental. Do not hesitate to ask for prices. It has Wifi included. 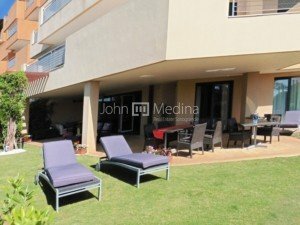 Please, contact me about ref 155-02479P, ground floor apartment for rent in Sotogrande, or similar properties.